If you’re lucky enough to live in a place where it isn’t summer anymore, feel free to file this away for use 7-8 months. But if, like me, you’re still seeing 90 degree temperatures and you’re looking for a fresh tasting meal, then join me for some gazpacho. If you haven’t made gazpacho before, you definitely should. It’s quite possibly the easiest dinner ever, it will sufficiently increase your fruit and vegetable consumption for the day, and if you’ve ever thought it would be wise to eat salsa straight out of the bowl, but spice is a concern – you’ll be in heaven. It’s great for a light lunch, but if you’re serving it for dinner you probably need to consider it as an appetizer or serve some heavy side dishes. 1. Peel and roughly chop the garlic and onion and pulse in a food processor until liquefied. Cut off the ends of the zucchini and cucumber and process until smooth. Roughly chop the celery and tomatoes and add until the soup is about the consistency of salsa. 2. Transfer to a large bowl and stir in the oil, vinegar, hot sauce, and V8. Taste and season with salt and pepper. 3. 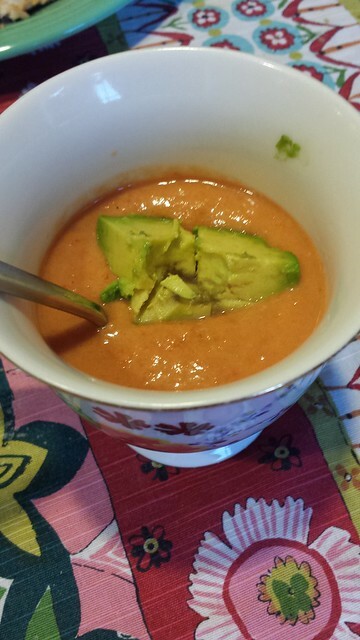 Chop the avocado and eggs and serve the gazpacho cold with the eggs and avocado on top.